Incorporating unconventional and objectively gross ingredients in beer is not even close to a new trend for microbreweries, who've been concocting special brews that evoke strange flavors for years. Hell, Stone Brewing Co. went ahead and created a pale ale from wastewater. 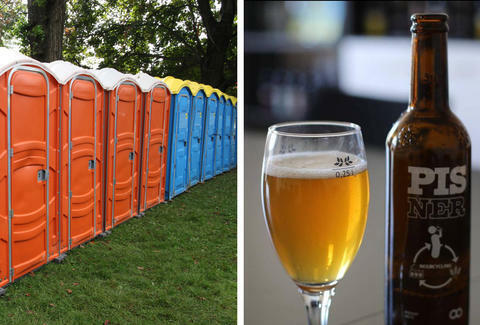 Now, one outfit in Denmark has upped the ante, with the release of its latest limited edition brew, which was made with one of the biggest byproducts of consumed beer itself: human urine. The Copenhagen-based microbrewery Nørrebro Bryghus has just unveiled a limited 60,000-bottle release of a special lager it made using over 13,000 gallons of piss collected from urinal troughs during the Roskilde Music Festival in 2015, which it's aptly calling Pisner. To be clear, the sudsy final product doesn't actually contain a single drop of pee. Rather, the malted barley used in the brew was fertilized with the urine, instead of traditional animal manure or plant-based nutrients. And according to those who've tasted it, it's actually quite refreshing. "If it had tasted even a bit like urine, I would put it down, but you don't even notice," Anders Sjögren, who attended the Roskilde Festival 2015, told Reuters. The brewery was inspired to take this unique approach to production after deciding to make all of its beers organic a few years ago, and Denmark Agriculture and Food Council has already given the process its own name: "beercycling." If you're feeling particularly brave and adventurous, you'll need to head to northern Europe to have a taste, since distribution is mostly limited to stores around Denmark. Otherwise, give it some time and this questionable craft beer trend -- like so many others -- will eventually catch on everywhere.